Here is wisdom. Let him that hath understanding count the (current) number of the beast: for it is the number of a man; and his (current) number is Six hundred threescore and six. Newly discovered ancient texts go on to add: "Of course, there is also, the Neighbor of the Beast. His number is Six hundred threescore and three." "Let us not forget the Child of the Beast. For she hath a number as well. Verily, she is Three hundred and thirty three..."
The Current Number of the Beast is a fun, fast-paced dice manipulation game. 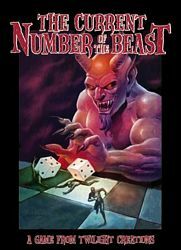 Players must use a combination of cunning and skill to be the first to get their dice to match the number on the current "Beast" card in play.